Me: You mean you wanted me to ask before I took the mushrooms and onions off your tray? Me: Okay, but I assumed you didn’t want them because you put them on the edge of your tray and you never eat mushrooms or onions. I’d say that was a pretty good assumption. Eva: Is that my fault? Eva: Is that my fault? Is that Mommy’s fault? Me: I guess you’re right… it’s not your fault. Next time I’ll respect you and ask first. First off, where does she learn this stuff!? I never blog letters to you anymore, but I had to get this down for posterity. I asked what was on your mind you said, “Daddy? Daddy?” We talked about how Daddy was at Auntie and Uncles’ wedding rehearsal and how before two people get married they have a practice run. I told you how the bride’s daddy walks her down the aisle and hands her over to her groom. Holding your hand and picturing you one day (Lord willing) I just about cried. Then we prayed that God would bring you a husband one day who loves Jesus so much. Someone you will partner with to bring more and more people into God’s Kingdom, just as your name says. Then I asked you how your day went and what could have gone better. You said “Grandma Grandpa house happy!” And we rejoiced that you love your Grandma and Grandpa so much. I asked what else was on your mind and you said “Frozen Heart microphone!” And we thanked God that He gave you a voice and that you love music and we prayed that you would use your voice and your words and your music to bring people to Him. Then we cuddled just a bit more, I told you that you were cute (“I cute!” you repeated emphatically) and I asked if you were ready to go to bed. “Yup!” you said. As we always do, I told you you’re our daughter in whom we’re well pleased, kissed you, and placed you in bed, re-arranging your stuffed animals to encircle you. And as we’ve been doing as of late, I made sure to cover all four limbs with your Frozen blanket and tuck you in. How amazingly sweet it is to have you as my daughter! You are truly my beautiful daughter and my heart is filled with joy as I think of you. What love the Father must feel when He looks at us, His children. As I do with you, Eva, He knows our flaws (seriously just minutes before during Bible time you threw a tantrum because you didn’t want to share the Bible with me lol), but also as I do with you, He loves us so much and calls us wonderful, beautiful, CUTE and wants us to take Him at His Word. Last month at the Seeds retreat, Pastor Jon talked about receiving the Kingdom as a child. We listed many adjectives that describe children: persistent, eager, loud, silly, emotional… messy!! But tonight I’m reminded too of the beauty of being like a child, of being so naïve, wanting your mother or father’s cuddles, being simple-minded, and easily pleased. Eva, I pray that you will always be able to take us, take God at His Word when we say that you are beautiful, wonderful, amazing, priceless. It grieves me to ever think about a day when you don’t believe us. I pray that you would know how to be loved, how to be treasured. I pray that you would know how beautifully, wonderfully, and fearfully you are made. Yes, you need a regenerate heart. Yes, you too are woefully sinful and need Jesus to save you. But I pray so much that you would have the quiet, humble confidence that comes from knowing God made you and that you are an image-bearer and that you are SO beautiful. My heart bursts with love for you. And if my hearts bursts with this much love for you, I can’t even begin to fathom the love that God has for us. So I’ll write a little about Miss Eva right now. How can words capture how I feel about Miss Evangeline? To say I love her soooooo much sells the feeling so short. Evangeline fills my heart with so much joy. Kenny and I think she is just the cutest thing ever and so incredibly beyond wonderful. It’s impossible to be objective when it comes to Evangeline. Yes, she has her moments, but even in her moments, even when she frustrates me to no end, there is this undercurrent of love and joy. I’m sure it won’t always be this way (imagine the teenage years! ), but when Eva is disobedient, often I’m holding back a smirk or a burst of laughter. Eva is a rascal, yes, truly the daughter of a little rascal! She loves to tease people (especially her daddy). She loves to flash her cheesy, toothy grin, scrunching up her little eyes into half moons. She loves yapping away and is sooooo talkative! But sometimes she can also be pretty serious. In new situations she often becomes very quiet, just observing and taking everything in. I’m still thinking she might be an introvert who also loves people, but we’ll see how things continue developing. It could also be that she’s an extrovert, but she’s just a little cautious and shy. Eva looooves to eat. Oh man does she love her carbohydrates. She eats pretty much everything, though she’ll get randomly picky from time-to-time. Food definitely brings this girl joy. We’re blessed that she eats well and there have been no problems since maybe around her 9-month mark in getting her to eat. Eva loves to play. She continues to take the cake as most active baby on Kenny’s side of the family. She gets into everything. She’s constantly moving, climbing, crawling, adventuring. When she’s excited she flaps her limbs vigorously. She loves shaking her head no while flashing her big grin. When she sees someone she’s excited about, she’ll let out an excited scream. She looooves going over to the Yuen’s to play while Kenny and me go to youth group. The other babies will eventually go to sleep, but she usually stays up the whole night with Uncle Bosco and Auntie Christine so she can play. Eva loves books. Her favorite book is called “Babies and Doggies,” but she also really loves her “Jesus Storybook Bible.” She loves tearing pages out of it and I just talked to her today about how I love the fact that she loves her Bible, but I want her to grow in her respect for it (meaning, stop pulling out the pages, girlfriend!). I love that she loves to read. And yes, it’s also super nice that she can sit for a good while now looking at her stacks of books so I can do things like use the restroom, get in a little work from home, or eat. There is soooo much more I could write about Eva! She’s growing her molars. She jumped from 1%tile in weight to 11th (again, homegirl LOVES eating). She loves music and will dance and nod her head to it. She loves when Daddy plays worship songs and will shake her baby percussion instruments. Her favorite stuffed animal is Bob the Monkey. She loves her pacifier animals Sophie and Ella. She cries when I leave her places now, but people say it’s only to make me feel guilty because as soon as I’m out of sight she’ll stop crying. She loves going on walks and will point at everything and do a ton of talking. She’s not the greatest napper, but PTL she’ll sleep from 7:30pm-8:30am if we get her down in time. There is soooo much joy in being a mommy to Miss Eva!! Yes there are hard times. In the moment it’s sometimes easy to lose perspective or get frustrated, but this has been a season of such overwhelming joy. My hope and prayer for Miss Eva is that she walks with Jesus every day of her life. We are praying BIG prayers for her. We are praying that she will be a missionary. We are praying that she would count her life as loss. We pray that she will live in light of the End Times. We pray that she would run hard after Jesus every day of her life. We pray that she would be BOLD and stand strong for Jesus in a world that is becoming more and more hostile toward His Word and His calling. And I’m realizing again and again that if I want these things for my baby girl, I personally need to be living out these things. Nevertheless I am continually with You; You have taken hold of my right hand. Happy 4 Months, Miss Eva! It’s been 4 months with Miss Eva and I can’t believe it’s been that long, but at the same time it feels much much longer (in the best way possible!). I am sooooo in love with our little girl and can’t imagine life without her!! Sure, we would be better rested, have more free time, and far better mobility, but the trading those things to have her in our lives is so incredibly worth it! Baby girl has grown sooo much this past month and not just in size! We’re now ushering in the rolling stage (also known as the “oh my gosh how many times do I have to wake up in the middle of the night just to turn you onto your back and you’re just doing this on purpose to see me aren’t you” stage), grabbing stage (hello permanent ponytail! ), and the babies are so worth it aren’t they stage (not that she wasn’t worth it before… I just think the timing is perfect– right when you start getting really tired they start doing tremendously cute things like smiling/laughing/gabbing all the time so you can never really be upset at them or at least not for very long). Rolling, rolling, rolling. Loves rolling on her side especially right before sleeping, which is actually a SIDS no-no, but after a couple nights of flipping her on her back and her waking up, I kind of gave up and figured she has her pacifier which is supposed to decrease SIDS… so hopefully they cancel out. The one good thing is home girl is able to easily pop up her head and shoulders now, which makes me feel more at ease. Also loves rolling onto her tummy in her crib even though she eventually hates it and cries. The thing is I’ve seen her roll tummy to back too so I think she just knows we’ll come in and flip her, but she also has quite a temper and her crying escalates into hysteria so I haven’t tried letting her cry it out long than 3-4 minutes. I sit there watching the clock, hearing her cries get crazier and crazier. Then I figure it’s probably better just to jump in there, flip her, pop the pacifier in, and make a quick exit so at least she can calm herself down. Sigh… sleep training! We shall see… maybe when I feel she can roll tummy to back as easily as she can do the opposite I’ll start letting her cry it out more. Grabbing. Loves to grab my hair, her own clothes, my clothes. Hasn’t been to grabby with other things… yet. Was trying really hard to grab the table cloth then my plate the other day though. Can hold her toys, but won’t consistently grab for them and can’t hold them up. I am so in love with our little girl and can’t believe how fast she’s growing! I think in the day-to-day I don’t notice it, but looking back at her one month post, I can definitely see how quickly she’s progressing and truly is no longer a little newborn! Some newborn things Eva’s outgrown so far: spending most of the time with her eyes closed, opening only one eye to check things out (ahh this was so cute… so sad! ), crying during diaper changes and she can last most onesie changes now without hollering (PTL for this one! ), happily spending tons of time in the Rock N Play, all her adorable newborn clothes! This past month has been so much fun and praise be to God so much easier too haha. Smiling and babbling sooo much now! 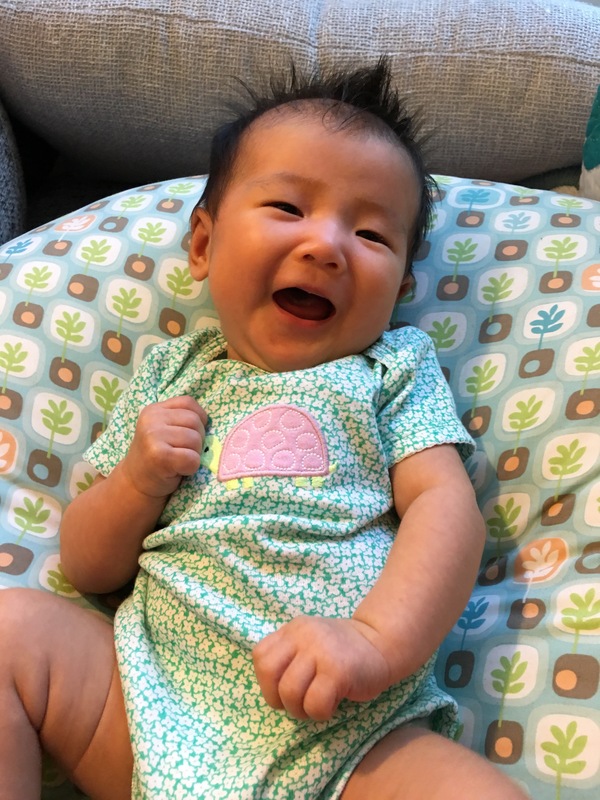 She LOVES her morning changing pad time when she smiles and babbles away. Looking forward to her and Daddy spending their mornings together while night owl Mommy gets some sleep!! SOOOO active!! Grandma calls her a wiggle worm and says she’s more active than all the kids and grandkids so far. Constantly moving all 4 limbs. Loves looking around at new places/things/lights (haha). Super strong neck. Always trying to push off you when you hold her. No longer wants to be held like a baby. Wants to be held straight up, preferably over the shoulder so she can easily look around. She’s like a little firefly– loves looking at lights, especially fluorescent ones. Thoroughly enjoyed her first time at the church office as they have 10x more lights than our apartment kitchen. Also likes looking outside, but not actually going outside. Once we actually go out whether it’s in the carrier or stroller, she always looks bored or closes her eyes. Spends a ton of time in her carriers and will usually knock out in them after a while. Enjoys getting one arm out of the Moby though. Doing better at being on her own. I think she’s realizing I’m the sucker who will always pick her up though. She does better when Daddy’s watching her and she’s on her back, but I feel like she always cries when I try to put her down. Nursing better too PTL. No longer snacking every hour since I started forcing her to wait 2-3 hours before eating again. Personality-wise, she definitely loves looking at new people and places, but goes to sleep when there’s lots of commotion. I think she might be an introvert as she gets overstimulated pretty easily? (Though the church moms say all babies at this age go to sleep when there’s a lot of commotion.) She does love to babble at lot though… maybe she will be like me haha. Quiet and introverted when out, but super talkative at home. If that’s the case, all I can say is, poor Daddy!! She also continues to be pretty sassy. She has a complaining/scolding cry and has no problem reminding you that you’ve upset her, so even after you’ve taken measures to calm her down, she’ll let out a little yelp a few moments later just to make sure you remember how upset you made her. Nana and Papa watched her a couple Saturdays now, so Mommy and Daddy had our first dates! (Ramen & 85 Degrees, Target & Souplantation) Sooo nice to have a couple hours of reconnecting and also working out some of the disagreements we’ve been too tired to fully discuss haha. Definitely wouldn’t want to do any of this with anyone else!!! Settled into a bit of a sleep schedule. We put her down anywhere from 8:30-10 and she’ll sleep until 2-3am. 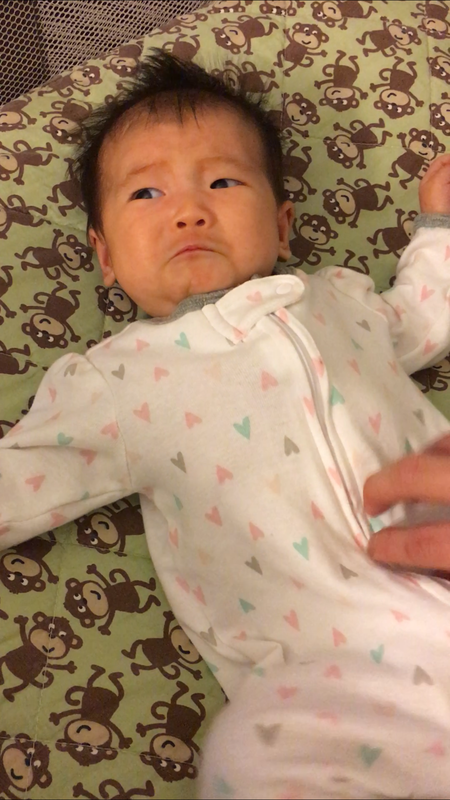 Feed her once, then put her down (or fall asleep… been trying so hard to not do this!). Then she tends to wake up every 1-2 hours from then on. I just realized too she doesn’t need to feed every time so she’s just waking up for comfort. Will try to sleep train that out this upcoming month. Had her first cold!! We took her to the kids urgent care on a Sunday. No idea where it came from as we hadn’t taken her out much. It was only upper respiratory congestion though so she was fine PTL! I got the stomach flu somehow. It was awful and probably the most sick I’ve been since January 2013 (or was it 14?). Had a fever and could barely get out of bed! Kenny stayed home and took care of Miss Eva for an entire day. She loved it! First new friend Kaydence was born almost exactly 2 months after Miss Eves and was almost exactly the same size– only 1 inch shorter! Showed Eva a picture and she smiled! I’m sure there’s many other things and I should really keep track of them during the month otherwise I forget. Plus I’m 10 days behind with this post, so I feel like there are things I’m thinking of that didn’t happen from March 11-April 11, but I’m not sure. Will add more if I remember. Overall, this past month has definitely been easier! We’re getting into a routine and finding a rhythm. There will be certain days that are especially hard, and overall I still have this general fog and tiredness, but it’s getting better! I’m thinking that this (fog, more tired than before [seriously– I used to think I was tired… bahahahaha!!) might be the new normal, and I’m figuring out too how to pursue the Lord and pursue others as He leads in this season. I’ve been starting to think more too about parenting and how I want to parent Eva and disciple her to pursue Jesus. I realized (and it still brings me to tears) that at a minimum, if we all live to an average age (again, this is all Lord willing and also not considering that maybe we’ll all be alive when He comes back!! ), baby girl will be living at least a third of her life without Kenny and me. That impresses on me even more the need to lead her to Jesus and show her how to follow Him. And even in the years we do have together, I know I’m going to mess up so much. And I know I won’t be able to be there for her all the time. I mean even now when we are physically in the same location 98% of the time, I can’t tend to her every need. Only Jesus can perfectly help her and guide her and be with her 100% of the time in the exact way she needs in this life. This life is just a breath. And I want to use every last second of the life I have left to show my baby girl that the only thing worth pursuing is Jesus. So how do I do that even now? Even when she’s a tiny babe? Because even though it might not seem like it, she’s learning and I’m sowing seeds into her life even now. Do the things I do and pursue show her that it’s so good to follow Jesus? Or does she see that I’m more interested in my phone, browsing social media or the web or texting? When something happens that upsets me, do I stop and pray and ask for help? When something terrific and exciting happens, do I stop and give thanks and praise to Jesus? In the conversations I have, am I saying things that lead others to Christ? Or am I subtly puffing up myself, trying to get them to like me or think I’m great? Am I cutting others down either to their face or behind their backs? Am I talking about things that matter or about things that are frivolous? What am I approving of by not correcting or speaking the truth even when it’s hard? Kids will learn far more from your actions than your words. I want to show her with my life, not just my words, that it is so good to follow Jesus– to live life with Him, for Him, and in His way. So like I said, I think this month God has been reminding me of my own brevity as uncomfortable as it may be. But the good thing is it’s getting me to examine my parenting and integrity. I want to live for what matters. And if I won’t do it for Jesus or myself (though as the Lord sanctifies me hopefully I’ll be doing it for more of Him!! ), then I want to do it for Eva. So she can live a life that matters. Because how sad would it be for her to live an amazing life, but to do so without Jesus? Anyway, this is kind of ending on a somber/sobering note. So I also want to note, if you can’t tell from all the points above, that being Eva’s mom is also so joy-filled. I adore her more and more every day and take so much delight in being her mother! 4:30 am on my first ever Mother’s Day. It’s weird to think this is a day now celebrating me. But as I scroll through Facebook reading other moms’ posts, memes, memories, I can’t help but chuckle, cry, wonder at how amazing it is to have the privilege of shepherding my baby girl for however long the Lord desires through this life. How wonderful it is to be your mom! To love another little being so much! To find every single thing you do (well, almost) hilarious, special, astonishingly cute. Even the not-so-adorable things, like your super scrunchy sad/angry face and the little sounds you emit when making a juicy diaper are things that bring me so much laughter and joy. I know it’s cliche, but who knew that you could possibly love a tiny little human who mostly sleeps, eats, poos, who only mostly grunts and cries and doesn’t even talk, oh so much!? On that note, sometimes I forget that you can’t talk. I babble on to you all the time narrating our life and when all you do is silently stare at me, or who am I kidding in more instances silently stare at the ceiling haha, I remember oh yeah that’s right she can’t respond to me! Another favorite of ours is dancing to music. Mostly because I want you to have good rhythm and better musicianship than me. I throw you in your baby wrap, grab the shaker, and we dance and sing along to whatever comes up on YouTube after typing in a random first song (Bethel, Hillsong, indie folk, classical… you are truly your father’s daughter as the classical puts you right to sleep!). I’m even coming to enjoy these middle of the night feedings as I had prayed over and over at the difficult beginning. How precious it is to see you find comfort in closeness, to see how you calm down when I pick you up and hold you next to me. I just melt too when you flash me your gummy side smile or reach up your precious little hand to rest on me while you feed. As much as it is fun, new mommyhood is definitely hard too. And there are days when I’m just staring at the clock begging 3:30 to come so your dad will come home and offer relief. (And then of course after offering said relief I’ll give him attitude or pick a fight over something silly… Lord, help me!!) But more and more now I’m trying to lean in harder to motherhood instead of just trying to survive and pass the time. More and more I’m learning to slow down, not stress when you’re upset or not doing what it is I want you to be doing (sleeping without being held during the day, not crying when I wipe your face), and treasure this very short time of life when you have such great need for me. For I know the day will come soon when you ask me to put you down, don’t want help, don’t want to be carried. And then the day will come when you’re too big to fit in my arms and no longer need all that much from me (help, comfort, etc.). Eva darling, oh how I love being your mom and treasure this first season of your little life!! So today is about you as much as it is supposedly about me. For there really isn’t much thanks I need for doing something that brings so much joy and sanctification and goodness to me. Happy first Mother’s Day to us both! I thank God so much for you, Evangeline Mikeina Yee!!! I know you don’t like being teased, but words cannot express how hilarious and at the same time precious I find this face!! My super silly, oh-so-happy, darling baby. Not really sure why as it wasn’t too different than any other day. I guess part of it was the overly ambitious 0.8 mile walk to get poke and boba on a hot April day. And I think the other part of is that little Eves has been fussier than usual lately and yes, as my sore lower back and wrists can attest, I do get tired of having to carry her all day, but more so I think what frustrates me that I can’t quite figure her out. Internal dialogue: Why is she so fussy lately? Is it just a growth spurt? But it’s been going on for a long time now! Should I give her a pacifier? Why do I feel the judgment of a thousand internet moms when I do and she calms down instantly (on that note, maybe I should just stop reading so many mom forums)? And if I don’t give her the paci, she’s so dang close to figuring out finger sucking soon as that index finger knuckle always lingers precariously close to her mouth and fingers are dirtier than pacis which you can wash, right? Am I spoiling her by carrying her constantly? But if I try to put her down no amount of shushing and patting will keep her content for more than 5 minutes. And what about nursing? Every time she cries now she acts like she wants to nurse (probably because I was too quick to nurse her every cry before! #newmomfail), but then when I nurse her she’ll only eat for a few minutes and/or spit up what seems like everything she ate within the hour anyway. I guess this is all just a part of new mommy-hood. The new mom boot camp that prepares you for the rest of your life! And yet, what they say is so true. When she finally flashes you a smile or lets out a little baby coo, when she finally calms down and you get 15 good minutes of play time in… oh my goodness it is so worth it and all I can think is how could I ever be upset with you!? Melt my heart, why don’t ya!? Sad thing is she’s probably smiling at Kenny and not me bahahaha. All this seems like one big exercise in learning to depend on the Lord, in remembering to ask Him for guidance and strength and wisdom and patience and grace and so much more! I’m in the crucible of learning to selfless (in other words, like Christ) and it’s hard because let’s face it often times what I prize more than my daughter or more than my husband is myself, my own convenience, my own ease. And actually what I thought would be most difficult part (no sleep) is turning out to not be all that bad. For one Eva’s been a fairly gracious sleeper (usually 3+ hour stretches though lately it’s been one long stretch, then waking every hour til Dad fetches her around 5:30) and I think too I’m just used to staying up til the wee hours of the morning and dealing with very little sleep. (All those ridiculously late nights in college are finally good for something!) Also, I’m trying to just treasure the time and was convicted to turn the phone to airplane mode to discourage mindless surfing (and also the Parents magazine scared me by saying they don’t know the long-term affects of kids being constantly exposed to wifi and cell phone signals yet… yikes! So they suggest turning phones to airplane mode when possible and never holding a cell phone up to your kid’s ear). 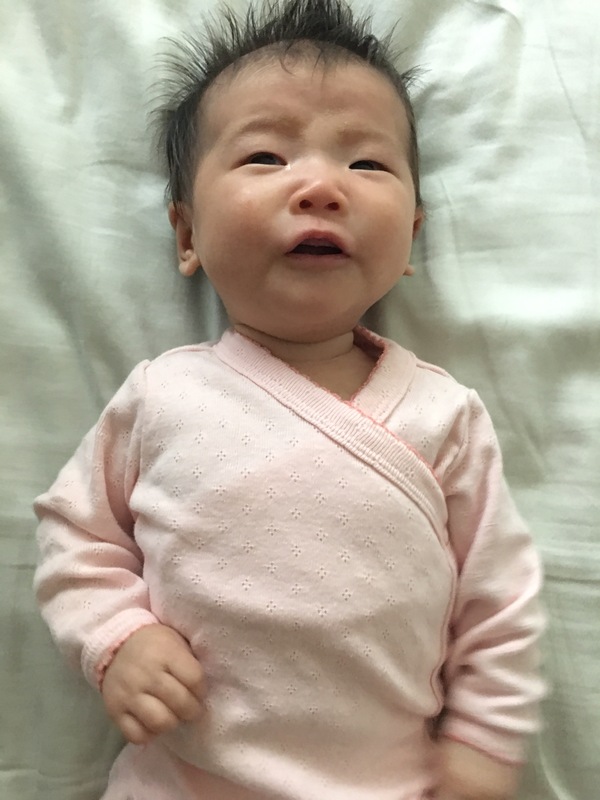 Instead, I’ve been striving to pray and commune with the Lord in those early morning hours when I’m holding little Eves upright (20 minutes to help reduce the spit up!) and listening to the dear husband snore. Though I do admit sometimes I can’t take it and give him a not-so-gentle kick hehe. So anyway, just some thoughts and reflections. I’ll end with this funny tidbit: last night Kenny graciously took Eva and gave me some me time to, well, wash the dishes (and really yesterday was the type of day when I relished the tiny respite that was dish washing!). When I finished I couldn’t remember if I had actually soaped them or not. I knew I had actually washed the cups, but I’m still pretty darn sure that at least half of the dishes had only been rinsed with water. So out came all the dishes and I had to wash them again hahaha. Totally the epitome of new mommyhood, am I right!?? Little love bug loves her daddy! Lord Jesus, help me to be more like You. Help me to be selfless and to truly treasure this short season that is new mommyhood. Give me Your character, Your patience, Your understanding. Give me wisdom as I try to figure out how to best care for our precious little girl. And help me to know there’s so much grace even when I fail. You are so good, O Lord! Thank You for Your love and grace! Help me through this whole process to understand what it means when You say You love us so perfectly and that we are Your children, and help me to teach these truths as best as I can to dear Eva. We love You, Jesus!!! We depend on You!! !